Sunoco Latko | Latko Wealth Management, Ltd.
My name is Sunoco! 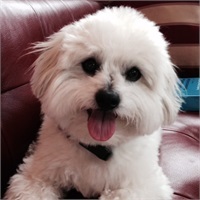 I have been the chief mascot of Latko Wealth Management, Ltd. for almost 4 years! My duties include barking, protecting the office, sniffing for treats and making everyone smile! My reward for all of this hard work is seeing the clients smile when they leave the office!